INCARCERATED UPND official Obvious Mwaliteta faces a possible murder charge in connection with the death of his cook sometime back in Livingstone where he served as Southern Province minister under the ruling PF, it has been reliably learnt. Impeccable sources said police were about to charge the former Southern and Lusaka provincial minister with murder over the death of his 19-year-old cook, Johan Lyakoka, who died in mysterious circumstances in 2013. 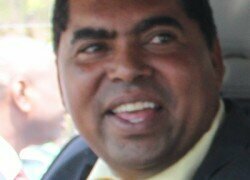 The sources confirmed that police officers visited Mwaliteta at Lusaka Central Prison, also known as Chimbokaila, where he is being detained on charges of aggravated robbery, and told him that they would soon take him back to court on a fresh charge of murder. But when contacted for a comment, police deputy spokesperson, Esther Mwata Katongo, said she was not aware of the development. Ms Katongo said she would carry out investigations and once she had information she would avail it to the media. “I am not aware about that. Someone had earlier asked me about that but I am not aware, I will try and ask my superiors and if there is any information relating to the matter I will contact you’’, said Ms Katongo. The body of Mr Lyakoka was found lying on the tarmac on the Lusaka road opposite Crossroads Lodge, a few metres away from where the deceased and his colleagues were staying.